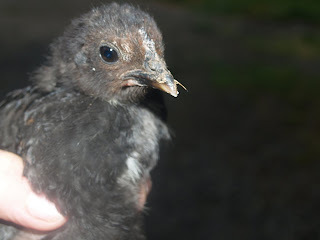 Here are some photos of each of the three chicks that we hatched last year. They are now about 5 weeks old, and doing great. 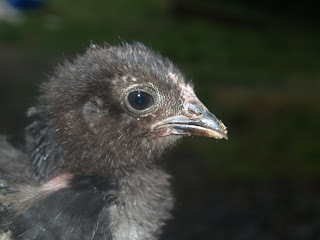 Featherlegs - the only rooster of the three, and by far the most charismatic of the chicks. Quite a character, although he is not afraid to peck the hand that feeds him!!! He has taken on his father's characteristic leg feathering. Most likely his mum is our other welsummer hen 'Henny'. Fivetoes (now named Daffy - by our daughter). She has taken on her father's 5 toes. Also likely to be half welsummer. She has the most feathering of the chicks. No distinguishable characteristics (yet to be named) - I initially though she was a he. Much slower at feathering up. She has no particularly distinguishable characteristics. 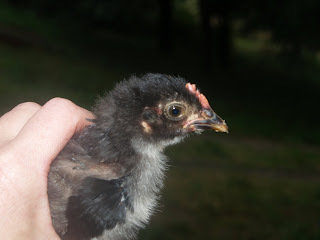 Most likely, her mum is our Light Sussex x Leghorn hen, a very good layer. Life has been good, if a little busy here. Trying to keep the ragwort from setting seed is probably one of the big jobs at this time of year, and unlike everyone else in the area, we are tackling it organically - so pulling or cutting the plants off. We hope that one day we can show people the place and say that you don't need to spray chemicals all over the place to deal with weeds. At this stage no one believes that it is possible!! Apart from weeding, another job that we have to tackle is tensioning the fence and adding droppers between the posts to make it harder for the goats to get out! Hmm, I read in a book that the goat owner spends many hours upgrading fences and trying to outsmart the goats, but the goats have all day to think of how to get out!!! How true! Ah, fun times.